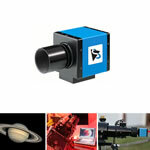 The SBIG ST-2000XCM color camera now uses the latest KAI-2020CM CCD from Kodak. 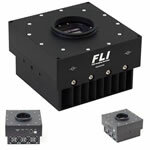 This new CCD has 1.8X lower read noise, 10X fewer bright points, and 2X lower dark current than the former KAI-2001M. 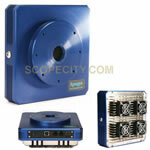 It is used in both the monochrome and single shot color version of the SBIG ST-2000XM camera. Other enhancements in 2004 include the addition of a custom Pelican Carrying case, EquinoX software for the Mac, and TheSky Version 5. In July, 2004, Kodak introduced the new KAI-2020CM CCD. 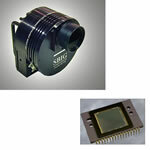 This latest version of the 2 megapixel CCD retains the improved QE of the KAI-2001CM and adds a high gain output amplifier that reduces the read noise by almost half compared to the previous CCD. In addition to lower read noise, the bright points have been reduced by a factor of ~10X and our tests show the typical dark current is also reduced by approximately 2X compared to the previous versions of the CCD. These same improvements are also found in the monochrome version of the CCD used in the SBIG ST-2000XM camera as of July, 2004 (All ST-2000 monochrome and color cameras beginning with serial number 20407000 or higher). Previously, Kodak improved the Quantum Efficiency of the ST2000 series CCD when it upgraded the KAI-2000M to the KAI-2001M. This higher higher QE is retained in the new KAI-2020CM, with approximately 25% to 40% higher QE (10% to 15% absolute) across the visible spectrum than the former KAI-2000CM. 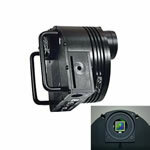 Also, In August, 2003, we switched to the larger TC-237H built-in guiding CCD instead of the TC-211. This improvement was the same as the upgraded autoguider installed on the larger ST-8XE, ST-9XE and ST-10XE cameras. In addition to the new CCD, in May of 2004 SBIG began including a custom Pelican carrying and storage case with the SBIG ST-2000XM and SBIG ST-2000XCM color models. This case is dustproof, waterproof and crushproof and carries a lifetime guarantee from Pelican. As of the date of this announcement, we are also upgrading the version of TheSky software by Software Bisque that we include with the SBIG ST2000XM CCD camera from version 4 to version 5, a $129 value. If you have a Macintosh computer running OS-X we will even throw in Equinox camera control and planetarium software for the Mac as well! We continue to include CCDSoftV5 in addition to CCDOPS version 5 for the most complete package of camera control, image processing, astrometric, star charting and planetarium software available with any new CCD camera from any manufacturer. 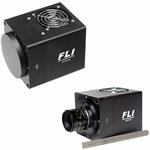 The TC-237 autoguiding CCD is seen here just below the larger imaging CCD. 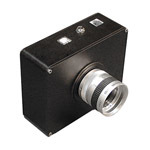 The TC-237H is the same CCD used in our ST-237A imaging camera and STV autoguider. The TC-237H is 2.7X larger than the TC-211 CCD which means there is a more than double the chance you will find suitable guide stars anywhere you happen to be looking without having to hunt. 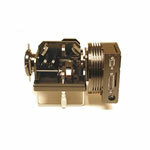 In the tracking configuration, the TC-237H CCD will normally be binned 2x2 for increased sensitivity. When binned 2x2 the field of view remains 2.7X that of the TC-211 however as the pixel size is increased to 14.8 microns. The user may also image with the TC-237 CCD in high resolution (unbinned) mode if desired. 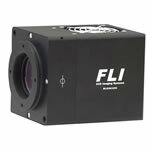 Even with a smaller field of view, however, the TC-211 remains an excellent autoguider for the SBIG ST-2000XM Color cameras. With ~15 micron pixels and low noise performance the TC-211 unbinned is more sensitive than the TC-237 in unbinned mode and as sensitive as the TC-237 in binned mode. In tests performed under moderate light pollution with an F/6 telescope, random pointing of the telescope in areas of the sky away from the Milky Way, we found stars on the TC-211 image bright enough to guide on 95% of the time. ThsSky software from Software Bisque automatically generates finder charts showing the correct placement of the guiding CCD field of view relative to the imaging CCD's field of view. Using this tool to plan your nights imaging is a great compliment to the self-guiding cameras. Previously, the camera had to be oriented so that the X and Y dimensions of the tracking CCD were aligned with the RA and DEC of the telescope, limiting the possible rotation of the camera to four possible positions around a target at at 90 degree steps. Now, with CCDSoftV5, the autoguiding capability of the TC-211 (and TC-237) is improved so that the camera may be placed in any orientation relative to the telescope's RA and DEC, allowing a full 360 degrees of rotation around a target for easier guide star acquisition. 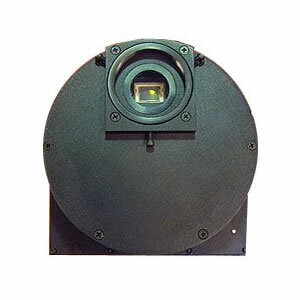 Of course, guiding with either the TC-211 or the TC237 tracking CCD means that the imaging CCD spends 100% of its time and quantum efficiency gathering the image. You are not required to compromise for half the quantum efficiency or twice exposure time as you might with other self-guiding designs. TheSky version 5, level II, is a complete camera control, image processing, astrometric, star-charting and planetarium software program for the PC. This is a full version of TheSky version 5, complete with manual on CD-ROM. This is a $129 value at no additional cost. Users of TheSky version 5 may upgrade to the latest version 6 at a discount. If you use an Apple Macintosh G3, G4 or G5, with OS X 10.2 or later, Equinox 5.1 can control SBIG USB and Ethernet cameras. SBIG will send a free copy of Equinox upon request to any new SBIG camera purchaser with proof of purchase. Send us a copy of your invoice with camera serial number. Note from OPT: You can read more about Equinox software from Microprojects by visiting our "Images & Links" tab and clicking on the appropriate link. The SBIG ST-2000XM and SBIG ST2000XCM Color models now include a high quality carrying and storage case made for SBIG by Pelican. This deluxe carrying case is dust proof, water proof, crush proof and carries a lifetime guarantee from the manufacturer. The custom cut foam securely holds the camera and power supply with additional spots for accessories, cables, etc. There is even room for the camera with AO-7 attached.